The Department of Education proposed two scenarios for zones for the new middle school at 75 Morton St. One includes the west side below Canal Street, the other stops at Canal Street. GREENWICH VILLAGE — The Community Education Council for Manhattan's largest school district on Tuesday night rejected a push by parents to expand the zone for a new West Village middle school. The District 2 CEC last month approved a zone for the school opening in September 2017 at 75 Morton St., but held a special meeting Tuesday night to consider a proposal by Community Board 2 and local parents to include a few additional blocks of Greenwich Village. "I plead with you, include those blocks," said Keen Berger, a Community Board 2 member and former CEC chair, at the start of the meeting. "The success of a school is amorphous and the political personal parental push to have those block in — which is not that many kids — is important." One CEC member noted that the blocks amount to about 26 families. Fourteen had showed up to the meeting to make their case. The blocks, from West 12th Street to West 14th Street between Greenwich Avenue and Fourth Avenue, are zoned for M.S. 104 (known as Simon Baruch). The Department of Education wanted to align 75 Morton's zone boundaries with those of the local elementary schools, so it included P.S. 41 on West 11th Street and excluded P.S. 340 in Chelsea. But Community Board 2 insisted the neighborhood should be kept together, and zoning those blocks out of P.S. 41's area when P.S. 340 opened a few years ago was controversial. It's still resented by the families on those blocks. "To me, it's absolutely heartbreaking that we would not be able to go to a school in the community that we are part of," said Jose Ruiz, who lives on 13th Street and Sixth Avenue, and said he and his half-Cherokee, half-Irish wife moved to Greenwich Village "because of diversity." Not being zoned for the school does not mean the students living in that area can't go to 75 Morton. About half of the students at other zoned District 2 middle schools come from outside the school's zone, according to CEC president Shino Tanikawa. "We are planning to have two admissions methods for the school," Tanikawa said Tuesday night. "One will be through the zone if you live in the zone. [Or] they can get in either through a screen or another mechanism to be determined." Parents who live north of 14th Street and have elementary school-age students at P.S. 340 insisted that all of the families zoned for P.S. 340 should also be included in 75 Morton's zone. "The families have really jelled there and the students have really jelled there and it seems a shame to exclude them," said Jayne Beilby, who has two children at P.S. 340. Others argued that the parents who were first to have children attend P.S. 340, and helped shape that school, would bring that experience to 75 Morton. Many members of the CEC balked at the new request, worrying about a slippery slope. "The problem I have — and I've done many, many zonings — is when you start going down that road, it never ends," said CEC member Beth Cirone. Some, like CEC member Matthew Horovitz, admonished the parents for not getting involved earlier in the process. The parents responded that they often didn't know about public meetings until after they happened. 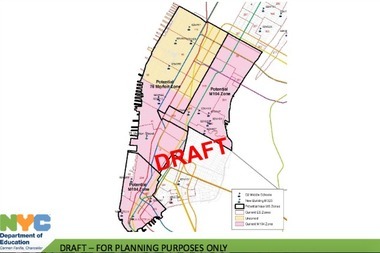 Horovitz was ultimately one of two votes on the CEC in favor of including the stretch between 12th and 14th streets. The other was Jonah Benton. The majority vote against the inclusion and were met with boos. The next phase in the 75 Morton process is selecting a principal, which will be done by District 2 Superintendent Bonnie Laboy. It's Laboy's choice whether to include the CEC and local involved parents in that process. ► READ MORE: Here's What You Need To Know About the New Middle School at 75 Morton St.